This electronic publication is Special Publication 18 from the Karst Waters Institute, consisting of selected papers and abstracts for the Hypogene Cave Morphologies symposium held February 2 – 7, 2014, on San Salvador Island, The Bahamas. The main thematic activities of the conference were to examine and discuss the unique cave morphologies and speleogens associated with hypogene caves, from the scale of 100 km+ cave maps down to centimeter size wall rock shapes and forms. Hypogene caves can be argued to represent a laminar flow regime that is quite different from the turbulent flow found in epigenic stream caves coupled to surface hydrology. Can these morphologies be uniquely characterized to identify hypogene caves? What effect do these laminar flow regimes have on geochemical models of dissolution drive in hypogene settings? 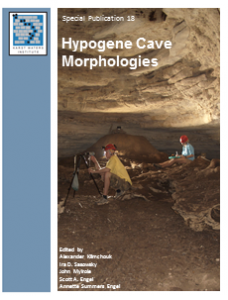 Do flank margin caves fall in the hypogene flow environment? Conference Proceedings (2014). ISBN Number: 978-0-9789976-7-0. Electronically published. 111 pages, Color cover and figures.